Is statehood the only option? 1. Full Independence - This would mean cutting all territorial ties to the U.S. and becoming the world's newest country. However, this option is unpopular in Puerto Rico, because locals are taught from a young age that independence wouldn't be feasible (a questionable claim). 2. Sovereign Free Association - In fact, this option would also officially make Puerto Rico an independent country - but it would be allowed to keep U.S. military protection and some other government services on a voluntary basis. Micronesia, the Marshall Islands, and Palau currently have this status. 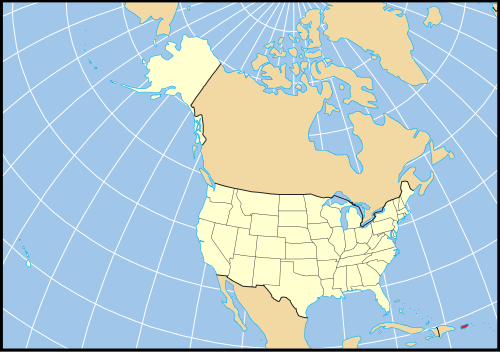 A fourth possible option - continuing as a U.S. territory but under modified terms - was controversially left off of the ballot. What would a State of Puerto Rico look like? In terms of population, Puerto Rico's 3.7 million people would make it a medium-sized state, with two senators and about five representatives in the U.S. Congress (and therefore about seven electoral votes for the president). Economically it would be the weakest of the states (though still stronger than most countries). But what it would lack in economic power, it would make up for in cultural and historical uniqueness, as the only state with a Spanish-speaking majority and the only state ever visited by Christopher Columbus. Geographically, it would be the third smallest of the states by area, and would contain both the new easternmost and the new southernmost points in the 51 states. How can a territory like Puerto Rico become a state? The U.S. Constitution only specifies that new states can't take territory from existing states without their permission, so the procedure is based largely on the Northwest Ordinance of 1787. That law set up the first organized American territory, in what's now the Midwest, and defined the process for admitting new states. To qualify for statehood, an area must have a population of at least 60,000 (no problem for Puerto Rico - there are over six times that many people just in the capital city). Then the U.S. Congress needs to pass an "enabling act" to get the ball rolling by authorizing the territory to draft a state constitution. Once it's ready, the state is admitted through a majority vote in Congress and the President's signature, just like any other law. That's all. Then Puerto Rico will become a state now, right? Not so fast - it's actually not clear whether the people of Puerto Rico really do want to become the 51st state. Here's the story: the recent referendum first asked whether Puerto Rico should remain a U.S. territory like it is now, and 54% voted "no" - so far, so good. Then it asked a separate question on what the best option for change would be - on this question, 61% of the votes went for statehood (compared to 33% for free association and 6% for full independence). Statehood it is then, right? Not quite. The meaning of the results is controversial, because many people left the second question blank, and if you include them, statehood only had 45% support. And even if you don't count the blank votes, 61% of the people who chose change on the first question would still add up to less than 50% of the total voters. On top of all this, the territory's pro-statehood governor was voted out on the same day, in favor of a candidate who supports the status quo. And it's been suggested that even a real 50% wouldn't be enough to fairly count as a mandate, since joining the union is basically irreversible (the last time any state tried leaving, lots of people died). So, will it happen or not? Probably not. In principle, President Obama has said he would support Puerto Rican statehood if the people clearly wanted it, and the opposing Republican Party wrote in their 2012 platform that they would support it too. But since the will of the people is anything but clear in this case, Congress reportedly has no plans to act on the referendum. A statehood law admitting Puerto Rico might not pass so easily anyway: since the new state might end up voting blue, the Republicans in Congress could be reluctant to admit it after all. And in any case, the process would likely be very slow: the legislators have their hands full with other issues already, and adding a new state could lead to a long process of haggling over how to rearrange the population-based seats in the House of Representatives (they would have to either be added to or redistributed to make room for Puerto Rico). Nevertheless, Puerto Rico's pro-statehood movement is still giving it all they've got. The territory's non-voting delegate to Congress, as well as the recently defeated governor, both have pushed forward in asking President Obama to get the process moving. And though it may seem like a lost cause in the short term, sources tell Political Geography Now that many Puerto Ricans are hoping statehood can at least be considered more seriously from now on.